Meet our newest Fab Lab resident, a nine-axis robot. we embed these values into everything we do—and everywhere we teach. Here, students learn skills they can’t learn anywhere else. When students explore in the Fab Lab, they become empowered to transform the world. ..although who wouldn’t think cutting through a piece of 4-inch-thick titanium with a 55,000-PSI stream of water and garnet-laced grit moving at 700 mph isn’t fun? We do this to empower students to transform the world. But the Fab Lab isn’t all shop talk. It also houses three studios, complete with a workspace, monitor and ergonomic chair for every student. These studios are part of the Governor’s Chair for Energy + Urbanism, our unique $2.5M collaboration of the College of Architecture and Design, Oak Ridge National Laboratory and world-renowned Skidmore, Owings & Merrill. The Fab Lab places the College of Architecture and Design amongst the most progressive in the nation in terms of digital fabrication and its impact on the practice of architecture. As an owner of a critical design practice with integrated fabrication services, I look to the University of Tennessee to cultivate the next generation of designers and makers. The Fab Lab is located at 525 North Gay Street, Knoxville. You can request a tour anytime. And if you can't make it in person, follow the Fab Lab on Facebook at UTFabLab. Donate today to help us fulfill the loan obligation for the Fab Lab building and convert the lease to student scholarships. Through rapid prototyping, students’ designs move from flat computer screens to models in their hands, not over days but in mere hours. Students work with many substrates, from foam to plastics and from titanium to aluminum, experience they couldn’t get anywhere else…and experience that raises the eyebrows of employers. In 2015-2016, students spent close to 350 hours fabricating on a CNC router. More than 300 student projects were fabricated on a CNC router and water-jet cutter alone in 2015-2016. 129,921 feet of filament were used in 3D printers in 2015-2016. Two full-time Fab Lab supervisors and a dozen trained student workers are on hand to teach students how to use the technology correctly and safely. 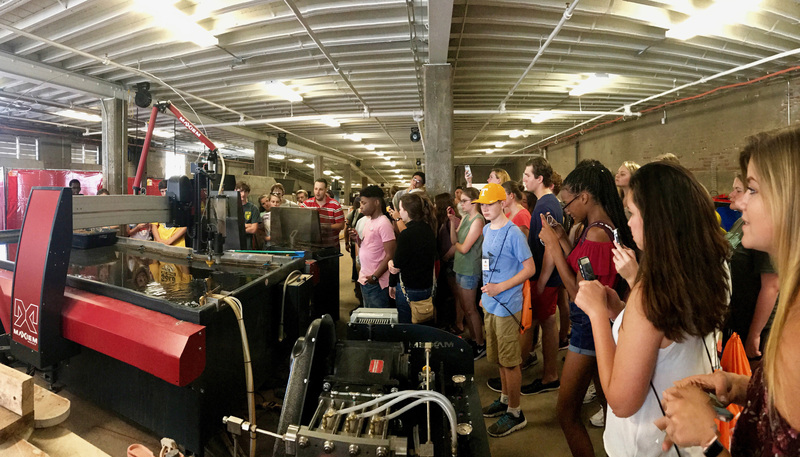 Students in a Governor’s Chair Studio in the Fab Lab contributed to a design for AMIE (additive manufacturing and integrated energy), which took 200 hours to 3D print at Oak Ridge National Laboratory and used 10K pounds of carbon-fiber reinforced polymer. The same digital file that printed AMIE prints prototypes at the Fab Lab. The Fab Lab offers 19 industrial- and consumer-grade 3D printers, including an SLA printer that uses a photopolymer resin, UV light and mirrors to create 3D models. The 4th rotational axis on one of the CNC routers transforms the router into a CNC lathe and allows accurate rotation of an object in fractions of degrees. Students learn to use multiple software programs to operate the technology in the Fab Lab, including Rhino and RhinoCAM, Makerbot, Preform and Catalyst. In 2018, we added a $400,000 nine-axis robotic cell to our already-impressive technology. The total value of equipment in the Fab Lab is more than $1M. Hours of operation, policies, calendars. You'll find what you need here to work in the Fab Lab and wood shops. Digital Fabrication Services @ the UT Fab Lab is a design resource available to academic and professional designers across the region. Services include production of prototypes and idea generation, leveraging the sophisticated digital and analog resources in the college’s Fab Lab and the expertise of the Fab Lab staff.